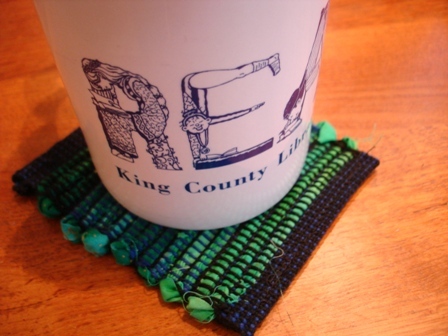 I just cut a woven project off the loom — hurray! There’s hasn’t been too much weaving around here lately, what with dyeing yarn and knitting, so it feels good to have gotten some weaving done. 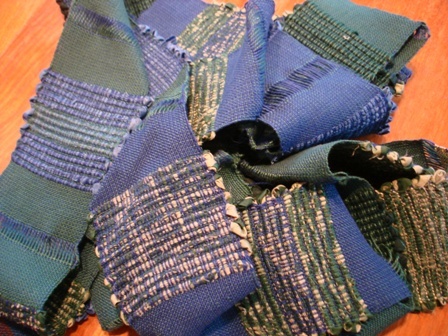 This is 30 mug rugs, which my weaving guild will be giving to the organizers of the 2011 ANWG Conference, Exploring Fiber Horizons, to put into attendees’ goodie bags. We’ve committed to giving 100, and may exceed that. Yay us! I’ll take them to our next meeting and they’ll get distributed to other members who will hem them. The final product will look something like this. It’s been fun to have an easy project like this for non-weaving members of our group to try their hand at. 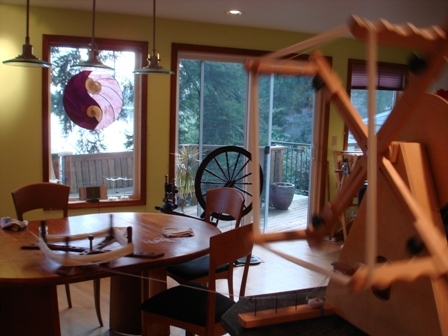 We’re happy to put new weavers on the slippery slope of new skills!